since... there are officially 100 days left in 2012. So, here's my list of what i'd like to get accomplished. 3. ROYGBIV quilt - Havent started. BUT we have fall break in 2 weeks..
Hadley, you're not allowed to get mad at me for this post, i'm just participating! dang! and I thought my list was bad! good luck on all of this, can't wait to see your progress! Good luck with all this ! Wow, good luck! 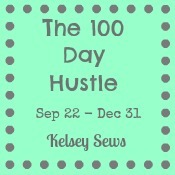 I'm hustle-ing too but won't be traveling like you will be! Love the list, and excited to see those projects come together!